The solar plexus chakra is sometimes referred to as the power centre of our body. It is located at the base of the sternum and it relates to the digestive system, the solar plexus, the liver, pancreas, adrenals and the mid thoracic spine. It governs integrity, the ego and the development of personal power. In Sanskrit, Manipura literally translates as 'full of jewels'. A balanced third chakra helps you to be yourself, look after yourself and to have the courage to follow your intuition. When this chakra is aligned it promotes action and assertion........it makes you energetic, dynamic and confident in yourself......you thrive on pressure, but you are not a workaholic. When it is out of balance energy levels are low, your self-esteem and confidence is diminished and you have a fear of rejection. 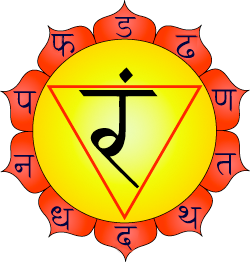 If there is too much energy flowing through this chakra then you might find yourself wanting to be in control of everything, often grumpy and uncooperative and having no patience. Digestion problems, ulcers, liver and gall bladder challenges, fatigue. Hate - for others and yourself, anger, fear, indifference, a need for power and control. The best essential oils to use with this chakra are uplifting, soothing and those that help with the digestive system, liver and gall-bladder. Frankincense, rose, neroli, sandalwood, chamomile and rosemary - help nurture the solar plexus emotionally. Ginger, peppermint, black pepper, lemon, fennel, bergamot and rosemary - help support the digestive system. Juniper, chamomile, rosemary and lemon - help with cleaning the liver and gall-bladder. Basil, chamomile, bergamot, geranium, patchouli, neroli, ylang-ylang, rose, jasmine and sandalwood - soothing oils good for nervous tension and anxiety. Fire is the element associated with this chakra, so using some drops of essential oils in an oil burner is particularly effective! Also burning candles can be very beneficial.